Hey there. I have all kinds of tech gadgets at home. Who doesn't like gadgets, right? The best thing about those gadgets is that they can be charged up with a USB cable. Music players, speakers, tablets, phones, keyboards, mice... if it can be charged up with a USB cable, I probably have some sort of variation or that gadget. lol But one thing that irks me about having to charge via USB cable is that I need a charger that will not only carry the correct charge, but be able to do it quickly. Enter the RAVPower 24W Dual 2.4A USB Wall Charger with iSmart Technology. Our good friends at RAVPower provided me with this great USB wall charger to try out and review! I know what you guys are thinking, "A USB wall charger... Really?" Yeah, a USB wall charger! These things are a MUST for the techie in your life and instead of getting a low powered one, you need to make sure that you get one that can handle the most demanding of gadgets! So before I get into my experience with this wall charger, let's talk specs! The perfect square shape for easy travel packing! The RAVPower 24W Dual 2.4A USB Wall Charger does what it sets out to do and does it well but before we get into that, let's check out the design. The charger itself measures approx. 2 x 2 x 1 inches. Perfect size for packing up and travelling. The AC plug neatly tucks into one of the sides of the wall charger. You can easily pull it out and tuck it in so that the charger keeps its square shape when not in use. On the opposite of the AC plug are the 2 USB ports. Both can carry up to 2.4A but the ports are each labeled as iSmart. You can get this USB wall charger in either white or black. Everything about this design is pretty good. All but the placement of the AC plug. You see, the wall charger has this perfect square shape to it. It looks good. It packs well. But when it's plugged into the wall to charge up your device, the square shape doesn't lay flat against the wall outlet. Instead, it sticks out. I would have much preferred if the AC plug was located such where when the wall charger is plugged into the wall, the charger would lay against the wall, keeping that square shape and minimizing the protrusion from the wall. A mall hiccup in the design, but a hiccup nonetheless. As for functionality, 2.4A is just what you need to charge all of today's most demanding tech gadgets. Tablets, in particular, require at the very least a 2.4A charge. Not only do you get that with this RAVPower USB Wall Charger, but you get iSmart technology as well. You see, a 2.4A charge is great for tablets, but it can potentially overcharge less demanding gadgets. iSmart technology identifies the device that's plugged into the wall charger and provides the most optimal amount of charge so that the device is not damaged. It's a wonderful safeguard to have! You can charge a tablet and a small set of headphones and know that you are not going to fry your headphones. And as added safety measure, the wall charger will automatically adjust the voltage intake so you can practically charge up anywhere in the world. No need to worry that the input voltage will be insufficient to power the device or that it is too much and will end up frying it. It's great to know that as long as you can plug it into the outlet, you will be get a reliable charge. Also, I noticed that the device automatically stopped charging once it's fully charged. Another great feature to have to avoid overcharging and damaging your device. I cannot stress enough that overcharging can, and will, damage your device! It's one of the main reasons why gadgets with safeguards to protect from this are in such high demand! USB Ports labeled with iSmart tech! My experience with the RAVPower 24W Dual 2.4A USB Wall Charger was nothing but exceptional. I travel a lot, and it's one of the reasons why an external battery pack is always with me, but why drain my external battery pack when there is an outlet readily available near by? And because the wall charger comes equipped with iSmart tech, I didn't need to worry about plugging into the correct USB. I must admit that some of the previous chargers that I owned would irritate me when I had to take the time to find out the required charge needed for the device and then have to match it with the corresponding USB port on the charger. It was a pain to do that. But if you didn't, you wouldn't get a charge. It was that plain and simple... and plain and simple is what I get with this wall charger. Just plug in and you're good to go. No worries, no hassles, no frustration, no problems. Again, there isn't anything glitzy or glamorous about the RAVPower 24W Dual 2.4A USB Wall Charger. It's small, it's powerful, and it gets the job done. When you own so many devices that require a USB charging station, that is all that you really want from your USB charger. Aside from the location of the AC plug (and again, that's just nitpicking! ), this wall charger is the only one you'll need to charge up to two devices. This is something that every techie, and non techie for that matter, should have! And if you act quickly, you can pick one up at Amazon for under $13! A small investment, if you ask me. So what do you think of this RAVPower USB Wall Charger? From the above, what sounds good? What sounds bad? What are some of your bad experiences with chargers? Let's hear it in the comments, friends! Later! That's awesome that it shuts off after the device is charged. It looks like the slots are lit too? That's a nice feature when trying to plug in something in a dimly lit room. Hey there Tanya. It really is a great charger. I didn't mention the blue lights because I thought a visual would say it all. Good luck! This device looks fantastic! I like to turn my computer off when I'm done with it, so this would be nice so I don't have to turn on my computer simply to charge my iPod. The iSmart also sounds great for my iPod, I didn't even know you could overcharge stuff and this would protect my iPod against that. Cutting after it's charged is really cool. It's the first I've seen for that. Hey there Jason. Yeah, not many chargers have that feature. It's one of the safeguards that I thought takes this charger above the rest. Good luck! Hey there Alexgo! I know the feeling! I used to have a USB cable always sticking out of my laptop to charge devices. This RAVPower USB charger eliminated that! Best of luck, friend! Hey there Nickie. It's a must have! Best of luck! This device would really help me charge multiple devices at the same time. Hey there. And charge them quickly! Good luck! I work from home so I don't use my cellphone as often as most. At times when it needs to be charged I plug it in but can sometimes forget that it's charging unless I get a call or text. My favorite part of the RavPower is that it cuts off when the device is fully charged which would be great for mt because I wouldn't have to stress if I have somehow forgotten it on the charger. Hey there Jill. Yeah, it's one of the features that I like the most. The last thing you want is for your device to overheat. Good luck! 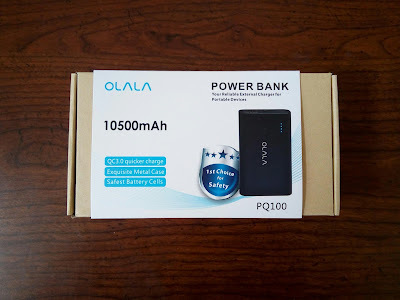 Thank You for the giveaway…It seems that the more expensive the smartphone you purchase, the greater the chance that the charger that comes with it is an afterthought for the manufacturer, a piece of under-engineered junk...at least that is my experience. I don't think I have had an "original equipment" charger that has not failed 12-18 months after purchase; and I treat them with kid gloves. Would love an "aftermarket" RAVPower USB Wall Charger !